Beautifully printed by Cartograf; well presented; striking markings. The green used on the sheet to replicate the squadron’s distinctive green is way, way too light. A well presented and produced product from DXM. Sure, there are glitches but remember, it’s your decision if you want to part with the cash! 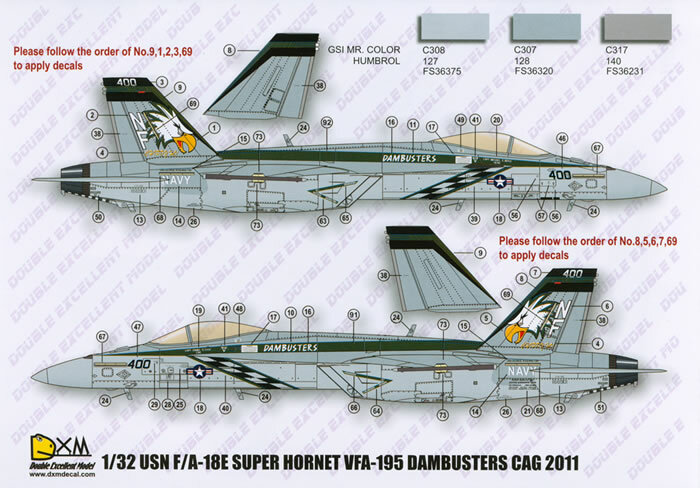 The subject of this review is sheet 21-3402 USN F/A-18E Super Hornet VFA-195 Dambusters CAG 2011. VFA-195 “Dambusters” are a part of the Pacific Fleets Air Wing 5 and home based at Naval Air Facility at Atsugi, Japan, and when at sea it is based aboard the USS George Washington. The squadron has always been known for its more ambitious CAG schemes and their recent transition to the F/A-18E model Hornet from the –C model Hornet was cause for the creation of yet another scheme. The new sheet(s) from DXM replicate this new scheme. 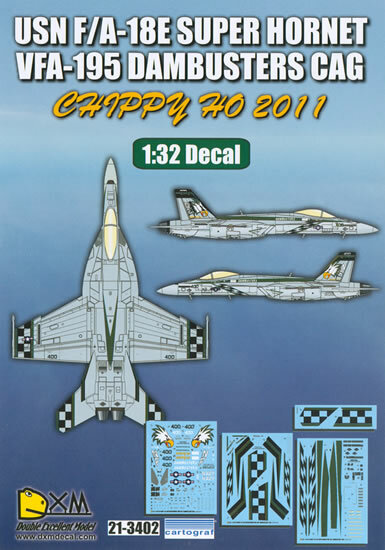 The decals are for F/A-18E Bureau number 166901. 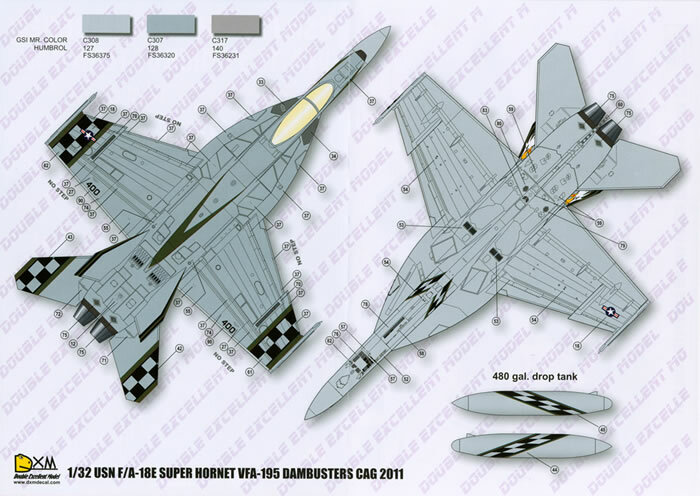 The aircraft is in the Standard Tactical Paint Scheme (TPS) worn by the Super Hornet comprising FS36320 dark ghost grey over FS36375 light ghost grey. 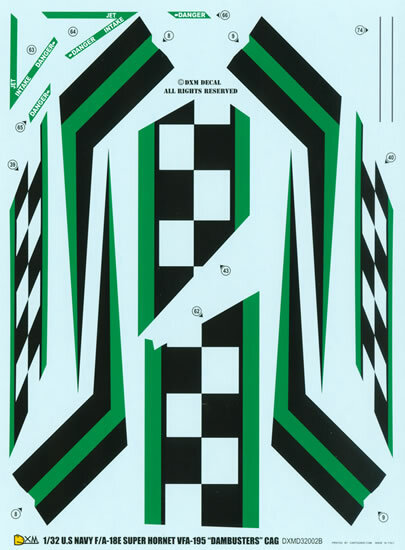 The sheet provides the complete markings for the CAG scheme, including the green stripes for the fuselage, the black and green checkers for the fuselage and the external fuel tanks, and the black/green/black leading edges/fincaps of the vertical stabilisers. Whilst it is great to have these markings as decals to save you a lot of effort in masking the unfortunate thing is that the green used on the sheet to replicate the squadron’s distinctive green is way, way too light. 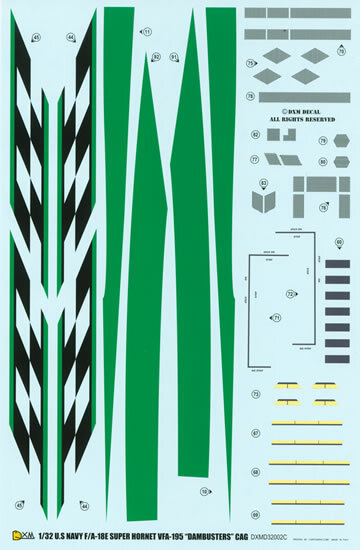 The sheet also provides extensive stencil data as well as the walkways, chaff buckets (empty), position lights (slime lights), the stripes for the arrestor hook and the various “grille” areas of the airframe – nose gear door etc. This is a very viable way of depicting these areas. You also get a set of national insignia but these are a little “funky” and best left on the sheet. Another oops is that the shadowing for the NAVY title has been done in black whereas they should be in the same colour green as the squadron markings. The decals themselves have been printed by Cartograf. They are very thin, opaque and glossy. The placement guide is an A-4 sheet with full colour printing on both sides of the sheet that shows good quality plan views and side profiles. Each decal is “keyed” to a number which is a good thing when it comes to the stencil data items. The decal sheets (4 of them in the 1/32 scale pack) come packed with a sheet of grease proof between each of them. They and the placement guide come packed in a cellophane baggie with a gummed edge that you always seem to stick to the decals when you are inserting them back into the baggie! 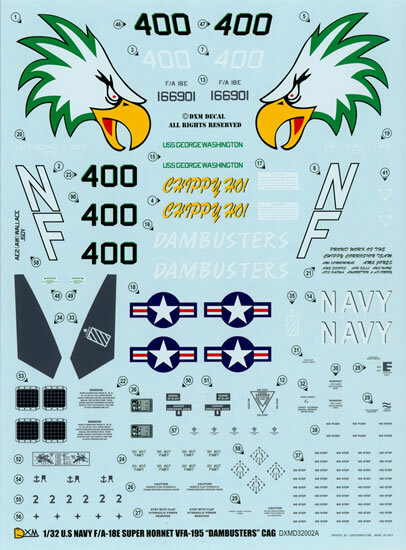 This sheet also comes in 1/144, 1/72, and 1/48 scale.